Almost all cameras use memory cards to store photos. You can copy those images directly from the camera to your computer (and Photoshop Elements 11) via a USB or FireWire cable, or you can remove the memory card itself from the camera and place it in a card reader hooked up to your computer using one of the same cables, or in a direct slot on your computer if one exists. When you work with Photoshop Elements, you most frequently use one of two workspaces, the Organizer or the Photo Editor. The Organizer is frequently your first stop for editing photos. Unless you have an image you want to edit in the Photo Editor and, therefore, open it immediately in the Photo Editor, your typical first step is to look over a collection of photos you’ve taken with a digital camera or imported using a scanner. Therefore, when getting images from your camera, you’re working in the Elements Organizer. 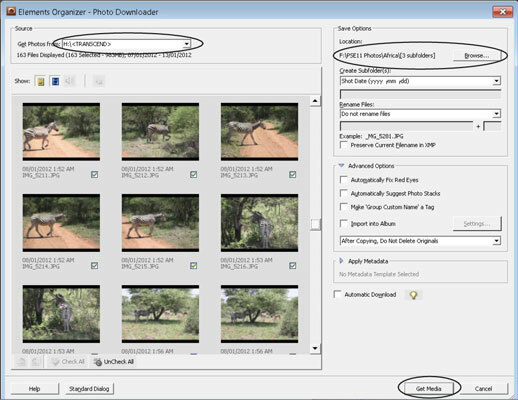 To load images from your camera in the Organizer window, you can open the Organizer and use a cable connected to your camera and your computer. Most digital cameras come with USB cables that can connect to both camera and computer. Don’t, however, upload photos directly from your camera. If the camera battery is low, Elements stops the upload when the connection is lost. The best way to copy files to your computer (if your camera supports a memory card) is to insert the camera memory card and connect the card reader to your computer via a USB cable. After connecting the card reader to your computer, upload files from the card reader. Hook up a card reader via a cable; alternatively, if you have a built-in reader on your computer, you can insert the memory card in the reader. Use the cable supported by your card reader. When you connect your camera or card reader, the AutoPlay Wizard opens on a Windows PC or iPhoto opens on a Mac. Cancel the AutoPlay Wizard (Windows). If iPhoto or Image Capture opens on the Mac, close the application. Click Cancel in the wizard or choose iPhoto→Quit to proceed. For Mac users, you can set Preferences in iPhoto to prevent iPhoto from being launched when you connect a camera or card reader. Open iPhoto and choose iPhoto→Preferences. On the General tab, select No Application from the Connecting Camera Opens pop-up menu. Click the Advanced tab and deselect the Importing Item: Copy Items to iPhoto Library check box. Launch Photoshop Elements and click the Organizer button on the Welcome screen. In the Organizer, choose File→Get Photos and Video→From Camera or Card Reader or press Ctrl+G (Command+G on the Mac). The first wizard you see when you choose the menu command is the Elements Organizer — Photo Downloader. This wizard opens when you choose to get photos from within the Organizer. At the top of the wizard, you find a drop-down list that displays your hard drive and a source, such as a camera or card reader, attached to your computer. In Windows, select a media source from the Get Photos and Videos From drop-down list. On the Mac, choose a source drive from the Devices list in the sidebar. Click the Browse button in the Import Settings area and locate a folder where you want to copy your photos. If you created folders on a hard drive, locate the folder where you want to copy the files. If you need a new folder, you can make a new folder in the Browse dialog box. After you choose a camera or card reader, the Downloader appears with the Get Media button active. Click the Get Media button and leave the other settings at their defaults. Wait for the Downloader to complete downloading all images before continuing. A progress bar displays the download progress. If you have many photos on your memory card, it may take a little time to complete the download. Be patient and wait for the download to finish. A dialog box opens when the download is complete. The download doesn’t copy images to the Organizer. To import the copied images into the Organizer, click OK. View the results. After the photos have been imported in the Organizer, you see thumbnail images for all the photos acquired from the memory card. After the photos are added to the Organizer, you can edit the images in the Editor’s Expert or Quick mode. Each time you import photos in the Organizer, only the last import is visible as thumbnails. If you have other photos you previously imported and you want to see both the new import and the other files in the Organizer, click the Show All button at the top of the window.